“God’s NOT Dead” The Movie. | It's the Women, Not the Men! 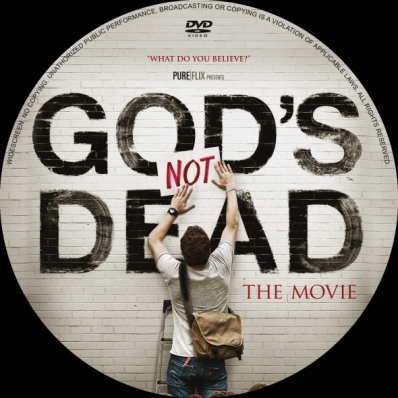 “God’s NOT Dead” The Movie. If you have not had the opportunity to see the inspiring, faith-based, film, “God’s NOT Dead”, your chance has finally arrived. The DVD has just been released and the film is now available for rent on Fios On Demand, as well. This is a great story about a college freshman, Josh Wheaton (Shane Harper), who refuses to accept Prof. Radison’s (Kevin Sorbo) demand that Josh, and the remainder of the class, accept the premise, that “God is Dead”, prior to the start of his philosophy class. The movie follows 5 story lines, all of which intersect at the end of the movie. But, the primary one surrounds Christian Wheaton’s acceptance of atheist Radison’s challenge to prove to his class, against formidable “scientific evidence”, that “God’s NOT Dead.” As you will see, Wheaton is more than up for the challenge. “God’s NOT Dead” will touch your heart and your soul. The production company itself is an inspiration as well. Pure Flix Entertainment is an independent Christian film company which has also succeeded against all odds. “God’s NOT Dead” is an excellent example of its success. The film was a small budget project with a limited release. Each week, primarily through word of mouth, the movie continued to be shown in more and more theaters. What started in a handful of theaters, finally spread to over 2000 theaters across the nation. to make a difference for His name. most of the media we experience today. families, friends, communities and church to impact our world for Christ. and blogs, live from the set of our new movies. positive messages that share the Gospel of Jesus Christ. I missed it in theaters, can’t wait to see it at home. It’s very good. You will enjoy it.